Okay so my marigolds were an epic fail. As in complete disaster. They were so sick and bug ridden that I dumped out the planter last night. 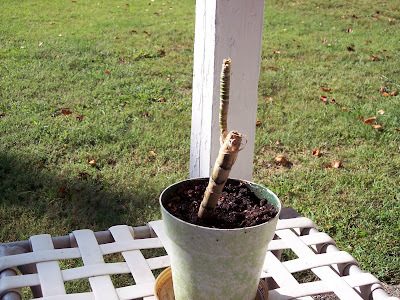 But the good news is, I think Jonathan's Ti plant may just come back from the dead again. Yeah, I know it's pretty pathetic looking right now, but if you click to embiggen the photo you might be able to see the teeny tiny nubs at the top of that stick. There's three so far and it looks like maybe another one farther down might be trying to sprout. If they all grow, the plant will end better looking than it has been since I planted it in the first place. Please send the little guy some good growing vibes. Thanks. PS: Yes, it's sitting on one of the lawn chairs that killed my shoulder when I scrubbed it clean.